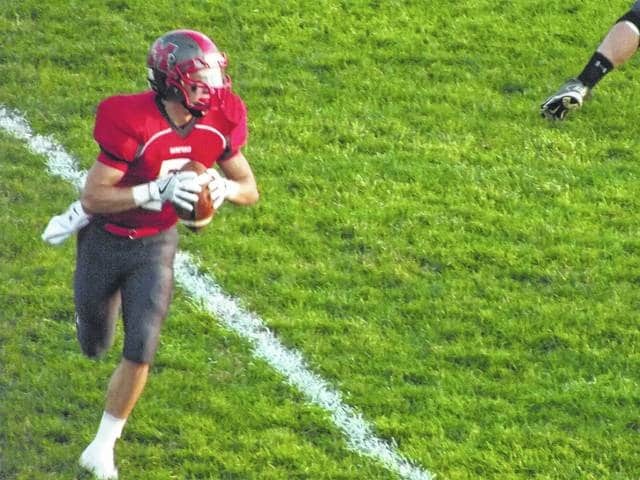 Minford’s Casey Gaines runs down the sideline for a Falcons’ touchdown. Minford’s Kelton Kelley goes through his progressions. MINFORD — The 2-2 Minford Falcons welcomed the 1-3 Williamsburg Wildcats of Clermont County, to Falcon country Friday night, defeating them 47-20. The win, in this non-conference match up, moves Minford to 3-2 overall. For Jesse Ruby, the contest represented a fulfillment of what the Falcons planned to do on Friday evening. “We wanted to try and limit our mistakes and take advantage of the opportunities they presented us, and we were able to do that tonight,” Ruby said. “(To) do what we do defensively and do what we do offensively,” said Falcon’s Coach Jesse Ruby of the team’s strategy going into the ball game. The fans did not have to wait long to see some great Minford football. The first fourth down of the first series of the game, Minford’s #23 Darius Jordan caught a diving catch from quarterback Kelton Kelley for a first down. Jordan’s catch sat up his team for a touchdown only three plays later, when #27 Casey Gains took a handoff and ran 13 yards. With the PAT good by #37 Caleb Yuhas, Minford took the early lead with 8:28 left in the first quarter 7-0. After a series for Williamsburg that took them nowhere, the Falcons got the ball back on the Wildcats 44-yard line. Three plays later found Minford in the end zone yet again in the first quarter. Ty Wiget collected a 10-yard run, Mason Brisker had a short tote, and a 30-yard run by Jordan put the Falcons’ ahead. With a good PAT by Yuhas, Minford cushioned their lead 14-0 with 3:54 left in the first quarter. Minford’s next series came after a punt by Williamsburg, saw a 75-yard run by quarterback Kelley and a series that was on the Wildcat 4-yard line at the end of the first quarter. During the very next play, the first play of the second quarter, Kelley handed off to Gaines for a 4-yard run and a Minford touchdown. With Yuhas’ PAT tacked on, the Falcon’s extend their lead 21-0 with 11:58 in the second quarter. The next series for the Wildcats looked to be their longest and best of the night, until a pass interception at the Falcons’ 17-yard line by Ty Wiget was ran back to the Wildcat’s 30-yard line. The next play, quarterback Kelton Kelley passed 30 yards to Darius Jordan for a Minford touchdown. Yuhas tacked on the PAT to bring Minford’s lead to 28-0 with 5:40 left in the second quarter. Before the end of the first half, the Wildcats would creep onto the board with an intercepted pass from Kelley ran back 26 yards for a pick six. Though the PAT was wide right, this put Williamsburg on the board with 6 with 1:26 left in the second quarter. However, Minford would answer the pick six, with a handoff from Kelley to Mason Brisker for a run into the end zone for another Falcon’s touchdown. With the point after the Falcons were up 35-6 heading into the locker room at the end of the second quarter. “We played them last year,” said Coach Ruby. “They ran a different offensive scheme and a different defensive scheme. Scott Lefker is their new head coach. They are doing some things differently than they did last year, and we were able to adjust to what they did differently.” Ruby said of his teams performance against the Wildcats. The second half so a plague of penalties and turnovers on both sides of the ball. Receiving the ball first in the second half, Williamsburg found themselves in early trouble when they fumbled the ball, with the help of Minford’s Mason Brisker, and recovered by Payton Middaugh for the Falcons. Giving Minford the ball early on in the third quarter, didn’t last long as Minford fumbled the ball two plays later that was recovered by the Wildcats. After several plays by Williamsburg, they fumbled the ball on the 50-yard line which was recovered by the Falcons. Four plays later, the Falcons were forced to punt the ball away. The ball was fair caught on the Williamsburg 14-yard line by Wyatt Lefker. The next play saw a chop block called on the Wildcats moving them back half the distance to the goal. On their own 7-yard line Williamsburg received another flag setting them back another half the distance to the goal, putting them on the 3-yard line. The next play the ball was fumbled by Williamsburg and recovered in the end zone by Minford #53 Luke Lindamood for a Minford touchdown. With Yuhas’ PAT no good, the Minford Falcons increase their lead even further with 5:01 left in the third quarter to 41-6. The kickoff by the Falcons was returned to the Wildcats’ 32 yard-line. The next play saw Lefkler run 68 yards for a touchdown for Williamsburg. Bringing the score 41-14 with 3:46 left in the third quarter. 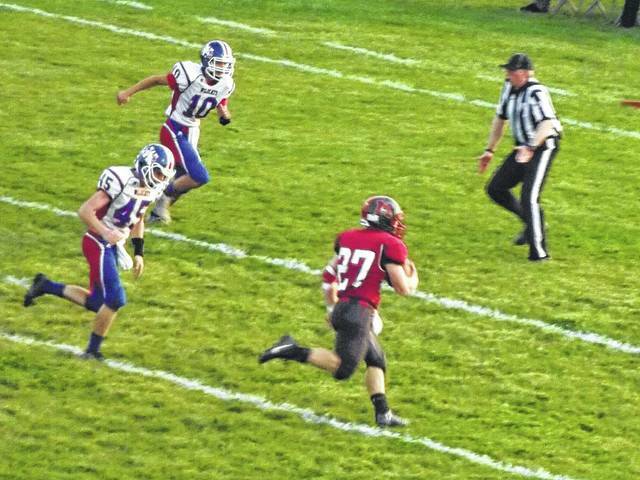 After an interception thrown by Minford, Williamsburg was able to capitalize on it with an eight-play drive capped with a touchdown run by Lefkler. Then came the strangest PAT series one has ever seen. Williamsburg kicked the PAT, there was a flag, Williamsburg kicked again, there was a flag, Williamsburg kicked a third time, there was a flag, finally on the fourth kick the PAT was good, however there was yet another flag thrown after the kick. With the Wildcats’ PAT the score was now 41-20 in favor of Minford with 11:56 left in the fourth quarter. After another fumble for Minford that luckily didn’t go anywhere for Williamsburg, Minford put together an eight-play drive of their own ending in a quarterback keeper for Kelley for a touchdown. Minford’s attempt at a two-point conversion was tipped for no points. This brought the Falcon’s lead to 47-20 with 5:32 left in the game. That is where the game ended, after a series for Williamsburg that ended with a four and two on the Minford 31-yard line, Minford took over, and let the clock run out to end the game. “Defensively, they run a lot of misdirection, so our focus on our kids was to line up properly and read our keys, and at times we did that really well. Offensively we just did what we normally would do in any offensive game plan, so you know, we kind of spread the field and see what mismatches we can take advantage of, and go from there,” Ruby said. Senior Mason Brisker played a strong game against the Wildcats.